I thought to myself if I put off writing this last blog post I could keep the summer going a little longer, unfortunately I don’t think that is how this works. So I would like to dedicate my last post to the people who made this summer so amazing. Thank you so much for the opportunity to be a part of this program. The experience I gained working with a federal agency has opened my eyes to many new career possibilities and has given me a more well-rounded perspective on research. In particular, thank you to Mary, Sarah, Haley, and everyone else at OSG who made this possible. Thank you for being so open and supportive throughout this summer. I hope we will stay in contact in the future, you really are some wonderful people and I appreciate all of the work you put into the program to make it as engaging and valuable as possible. Haley, thank you for putting in the extra effort to get to know us. Having you there to ask questions to was also very helpful. Ted DeWitt: Thank you first and foremost for putting in the request to have an intern. I’ve enjoyed the time I’ve been able to spend at the EPA and I’ve learned so much. You have been a great mentor and I’ve appreciated all of your advice and support. Jody Stecher: This summer you were my go-to-guy about this project. You took the time to make sure I fully understood all of the concepts we needed to know, genuinely wanted me to excel in the work we were doing, and truly cared about Katie and I. Thank you so much for being a great mentor and an amazing person. Darryl Marois: Thank you for taking the time to help me through some of the data analyses and spending a lot of time to make sure things were straight forward for Katie and I. I knew I could always go to you with any questions and you would do your best to help me figure them out. Thank you for everything. Nate, Lauri and Cheryl: I would really like to thank all of you for your help and mentorship this summer. You weren’t working on the same project I was but you still took time out of your day to give me valuable advice and mentorship. Nate, I really enjoyed working on the cockle experiment with you, I hope the paper turns out well. Lauri, thank you for holding the professional development workshops and looking over my resume. I really value your opinion and you went above and beyond to try to help us interns. Cheryl, thank you for taking the time out of your busy schedule to give me career advice, I really appreciate it. You are all amazing people. Thank you for the unforgettable summer and I can’t wait to see what awesome things you all accomplish. One final thank you. This summer has been unbelievable. This has been a pretty exciting week! On Tuesday, Katie and I gave our final presentation for the EPA. For Week 10 I’ll mainly be working on trying to identify trends in some oxygen data from a previous salt marsh study. On Friday, all of the interns gave a five minute presentation and participated in a poster session for sea grant and other people from HMSC. This was a bit nerve-racking but an overall valuable experience. This past weekend was packed with activities. We saw some bioluminescence on South Beach, stuffed ourselves with some of the best tuna I’ve ever had at the Great Albacore Tuna BBQ Challenge, Justin and I took a surfing lesson, we we all grilled some great shish kabobs, and had a movie night. If you get the chance to come to Newport for the Great Albacore Tuna BBQ Challenge I highly recommend going. It is relatively inexpensive and it was the best seafood I’ve had in Oregon so far. Just having the variety of different types of prepared tuna made it worth going. My favorite was the one that the Chamber of Commerce put together. I wish I had asked what they were calling it but it seemed to be a take on a Chinese food appetizer. It was amazing. 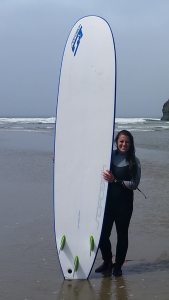 Surfing was one of the best experiences I’ve had while here in Oregon. I love being in the ocean, which is one of the main reasons I initially wanted to spend my life studying it. Surfing is just another great excuse for you to spend a ton of time in the ocean, so of course I loved it! It was very obvious that I wasn’t at all a natural at surfing but I was able to stand up a few times which was all I wanted to be able to do. I was shocked to find out how exhausting it is. Looking back at it though it does make sense. In order to get down to the spot where we surfed in Agate Beach, you have to climb down a pretty steep dirt pathway and then walk pretty far with the surfboard until you even get to the ocean. From there you have to simultaneously fight being over-topped by the waves, staying on the surfboard, and also trying to stand up (in order to do that you have to basically do a burpee which is hard to do even on solid ground). Personally, the hardest part was the fact that beginner surfboards are HUGE. I’m 5’ 0’’ and the surfboard was so large I couldn’t tuck it under my arm. So I had to awkwardly carry it over my head or out in front of me. Not surprisingly, the next day I had some trouble walking and lifting things. But it was so worth it. It’s getting to be that time where we can all start to see the light at the end of the tunnel and it is so sad! Only two more weeks in Oregon and there is still so much I wish I could have done/seen. I won’t get too nostalgic just yet though. Week 8 was filled with presentation and poster prep. My blog post for Week 9 will be all about the presentations for the EPA and Sea Grant. Katie and I have our presentation for the EPA this coming Tuesday. This past weekend I went to Corvallis and got a tour of the OSU campus. I really liked it and will definitely be looking more into the OSU graduate school. Also, Corvallis has a pretty awesome farmers market! On Sunday Angus and I went to Neptune (just south of Newport) at low tide with Jody to look at some amazing rock formations and tide pools! 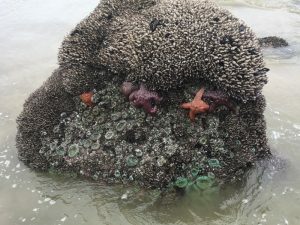 I saw my first wild sea stars and more anemones than I’ve ever seen before. There was also a really cool cave called Creature’s Cave. It had a great view when looking out of it but it was definitely pretty creepy inside. There was a pretty beat up mattress, lots of mail (Todd Graham I think your mail is being delivered to the wrong place…) and a bunch of very…interesting graffiti. If you are adventurous you can camp out in there! So far Katie and I are still working on our PowerPoint presentation for the EPA. We should hopefully be done by later this week and be able to present by next Tuesday! It is crazy how fast this summer has gone by. Next week is our final symposium for Sea Grant where we have to give a short presentation and create a poster. In our last week I’ll be writing my reflection paper and most likely helping Jody and Darryl process some more data for the project. 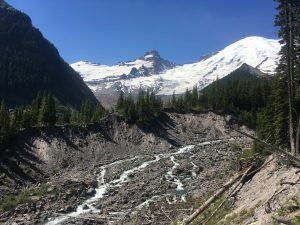 As for this past weekend’s adventure, I went up to Washington for the first time and visited Mt. Rainier National Park. I stayed in Yakima, Washington (since it was fairly close to Mt. Rainier) and the drive up there wasn’t at all what I expected. It was mostly desert (which now makes sense since we are on the leeward side of the Cascade Mountains) and reminded me of the landscapes in Utah and Nevada. The most shocking part was that the first day I got there, the weather hit 114 degrees Fahrenheit! A HUGE change from the steady 65 degrees in Newport. To get to Yakima I had to drive through the Columbia River Gorge. Which, if you are ever in the area, I highly suggest going to. I’m not entirely sure how much you can do there but it was surrounded by vineyards and there were many kite and wind surfers so it looked like a really fun place! As you move further towards Mt. Rainier the area becomes densely forested and reminds me more of the Pacific North West. The mountain and its surrounding land were beautiful. There were some really cool hikes that I would have loved to do if I had more time, I’ll definitely have to go back! Since all of our field and lab work are done, Week 6 mostly consisted of office work. I’ve had a lot of time to start making graphs of our soil data and analyzing some of the trends. I actually had this blog post typed out a pretty long time ago and didn’t realize I saved it as a draft so I decided to just publish it now as I would have originally (oops!). We are having some difficulties with the elevation corrections for each site so hopefully by early next week we will have that figured out. That way we can start analyzing how the soil characteristics of each site impact the hydrology in the marsh. I’ve also started learning how to do basic operations in R. This is something I’ve wanted to learn how to do for a while and, if I can get good enough at using the program, I may be able to do some of statistical tests for our data in the program. I installed the swirl package into RStudio which is a program that teaches you how to navigate and enter data into R within the R program. So for the past few days I’ve been running through all of the courses in R that I can find which has been draining but also really interesting. Katie and I have to give a presentation on our work this summer on August 9th for the EPA so we have started putting a PowerPoint presentation together. I’ve actually been learning a lot of great new techniques for presentations from some of the contractors and post-docs working here. Once we finish that presentation, I’ll start putting my 5-minute presentation, poster, and final report together for Sea Grant. This past weekend some of the interns went down to Crater Lake National Park, Toketee Falls, and Umpqua Hot Springs. Crater Lake was beautiful and it is a MUST to jump in. There isn’t a ton to do at the actual lake, there is only one trail that leads down to the water. Have no fear, there are plenty of hikes, waterfalls, and yes, hot springs in Umpqua National Forest. I would love to post a picture of the hot springs since they were incredible, but none of the pictures did them any justice. There were approximately 6 small pool type areas to sit in that were nestled into the side of a cliff that overlooked a raging river. The pools became cooler as you went down the cliff face but they were all warm and a beautiful green color. Since the weather is typically pretty warm in the forest during the summer, I’d recommend trying to get to the hot springs later in the day when it cools off. On the other hand it may be more crowded later in the day, you’ll just have to give it a try! This past week has been crazy! 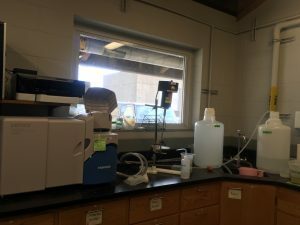 We finished processing our soil samples last Thursday which was a relief but now we have to go back into the data and make all of the necessary corrections. Today we are taking a look at the percent sand, silt, and clay in each sample to see if our PSA data seems to be normal. Fingers crossed they are! Last Friday we had our mid-summer check in where each of us had to give a short presentation and then we listened to a couple presentations on science communication. Afterward, we went camping in Willamette National Forest at the Trout Creek Campground. The drive out there was beautiful and it was really nice to be able to spend an extended amount of time outdoors. 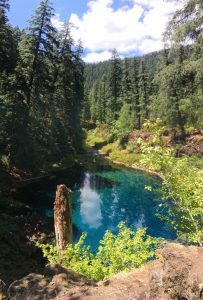 We hiked to the Tamolitch blue pool on Saturday morning which had the most beautiful sapphire colored water I’ve ever seen. Some of the interns had the guts to jump into the freezing 38 degree Fahrenheit water. Some of the interns and I stayed an extra night at the campground and drove out to Bend, Oregon on Sunday. We hiked a loop that that allowed us to see some amazing views of South Sister Mountain and ended at Moraine Lake. The Cascade Lake Highway cuts through Mount Bachelor and the Sister Mountains and is definitely worth the drive. If I ever get the chance to spend more time in that area, I’ll definitely try to do the South Sister Summit hike. 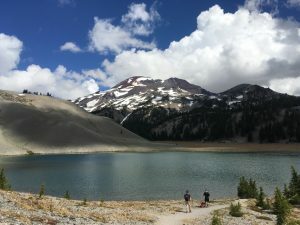 It would also be awesome to spend more time in Bend, which seems like a cute town and there are a lot of opportunities for outdoor activities. This past Monday we had a full day in Tillamook doing the last of our field sampling. When we first got there the mosquitos were in full force. I’ve never been swarmed by that many mosquitos before it was pretty miserable for the first couple hours, but luckily they died down. We put 5 more wells in our Bay O site so we now have more soil to process in the next couple weeks. 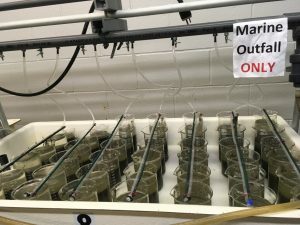 On Tuesday, I started helping Nate (a contractor at the EPA) with his experiment which is looking at how cockles react to variations in temperature. So at 7am we had to go out to the mud flats outside of Hatfield and rake for cockles. It was actually very therapeutic and we ended up being able to collect 80 of them! On Wednesday, we started the experiment by measuring the cockles and then putting six in each treatment (6, 14, 22, 30, 34 and 38° Celsius) for two and five hours. Yesterday we tested their response by seeing if they buried themselves in sediment within a 24 hour period after being exposed. Next week I’ll start playing with the data from our soil samples and the hydrology data! It’s Week 4 so we are almost to the halfway point of the program. This is crazy. There are still so many things I want to see and do while I am still in Oregon but we are running out of time! This past week has been, yep you guessed it, all about soil processing. We have over 200 samples that we are currently processing through the PSA machine and there are more to come! We are doing a last minute site next Monday to get 5 more cores (which could be about 50 more samples) so the entire soil process will re-start with those samples next week. I’m definitely getting myself some Tillamook ice cream. Since we have a better feel of how to get these samples done, hopefully they will be processed quickly. Then we can play with the data! This is the PSA machine I’ve been working with. The water in the jugs feeds into the machine so the soil samples can be circulated easily. There is a computer monitor to the left of the PSA machine (I couldn’t fit it into the shot) where you can control how it operates. There are a lot of opportunities to stay active while in Newport. I hate running. So I try to get as involved in sports as possible. My mentor Jody, and a couple of other interns play ultimate frisbee every Monday and Thursday with some really awesome members of the community. There is also a pick-up soccer game that happens every Wednesday at noon outside of Hatfield. Even though Newport tends to be a bit cold for me, it is the absolute perfect weather for running around (unless it’s super windy, then throwing the frisbee can be difficult). 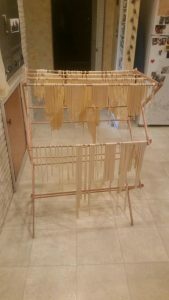 This past weekend, a couple of the interns at the EPA went to Jody’s house to make pasta! I’d never done anything like it before but it was actually a lot of fun. It took about 3 hours to make enough pasta for 5 people and it was pretty tedious work flattening the dough over and over again, but wow was it good. I put a picture below of all of the pasta we made. We had to hang it on a drying rack so the pieces wouldn’t fall apart or stick to each other. We have our mid-summer check in this coming Friday where we have to give a small presentation about the work we have been doing so far and then we go camping! I’ll have more details about that next week. Week 3 has come and gone! I already find myself planning trips for every weekend we have coming up and it’s scary to see that we really don’t have many left. Similar to Week 2, this past week mainly consisted of soil processing in the lab. We did have one field day in Tillamook Bay which ended up being really nice. The trip was mainly to make sure our wells were still in place and hadn’t been tampered with. Unfortunately, one of our wells had the logger taken out of it and we found the logger lying next to the well. In the field we were able to download the data and it looked like the logger was pulled only two days into the sampling period. It was a huge bummer to realize we lost basically all of the data for that well and we most likely won’t be able to make great conclusions about that transect because of it. We are fairly certain that it was most likely a person that tampered with the well due to how we found the scene and the time that the logger was pulled. Since the logger was found right outside of the well, it was pretty clear that whoever pulled it wasn’t doing it to steal, they were probably just curious. I do understand that, but their curiosity cost us really valuable data. So, just as a disclaimer to the public, PLEASE do not touch field equipment that clearly isn’t yours. In the grand scheme of things we are actually trying to help you. On a more positive note, we’ve lucked out so far that every day we have gone into the field the weather has been beautiful. This past field day we of course stopped for some ice cream and then we got lunch at the Blue Heron which was an awesome little cafe. Hopefully this coming week we will be able to start doing particle size analysis (PSA) on our samples and analyzing some of the data we have gotten back. 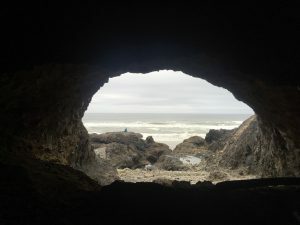 On the personal side of things, we took some cool trips to Otter Rock, the Devil’s Punchbowl and Lincoln City. We have also been barbecuing a lot which has been delicious. Yesterday was the 4th of July and it ended up being one of the warmest days we’ve had since being here. We went to a small party at one of the apartments across the bay from Hatfield which had a perfect view of the fireworks Newport put on. We met some extremely nice people who lived in the community and ate so much that we had to go to sleep as soon as we got home. Hopefully in the upcoming weeks I’ll be able to talk about some interesting trends in the data we’ve been collecting and maybe some cool weekend trips inland (I really need to get warm for a little while). So as an extension of last week, my work has consisted of preparing all of our soil samples (250 of them) for particle size analysis (PSA). This technique will tell us the proportion of sand, silt and clay in each of our samples which will give us a better idea of how water moves through the salt marsh. This will give us a lot of valuable information about the Tillamook Marsh sites so it’s necessary, but it has unfortunately been a fairly dull and tedious work schedule this past week. Therefore, I don’t really have much to report on but we will soon be able to analyze our data which will get very interesting. Other things that we did this past week included going to the aquarium (on world oceans day!) and Cape Perpetua. 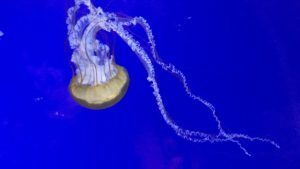 You can ask anyone who has spent any sort of time around me, I love jellyfish. So, naturally, I am going to include a wonderful picture. We also watched an otter feeding, saw some gigantic crabs and were able to touch some anemones. 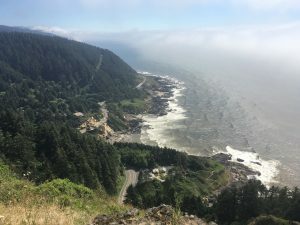 On Sunday, we drove down to Cape Perpetua (about a 35 minute drive) which was absolutely beautiful! Here is a view from the top. We hiked around for a while and saw some cool sites such as Thor’s well. Make sure to check a tide chart before going. During high tide it is supposed to be awesome with water spewing in and out of it. Unfortunately, we were there around mid-tide so it mostly just looked like a hole. Still cool though! I almost forgot! Finding Dory was awesome. Definitely go see it! After traveling across the country for 11 days and putting 4,000 miles on my car, I finally arrived in Newport, Oregon! This being my first time on the West Coast, I really didn’t know what to expect. I recently graduated college in upstate New York so I was more than ready to see and live in a new part of the country. As of right now I can say that I am really enjoying my time here and I am very excited to see what the rest of the summer has in store for me and the research team I am working with. My internship is stationed at the EPA’s Pacific Coastal Ecology Branch under Dr. Ted DeWitt. Our research team consists primarily of Ted, Jody, Daryl, Katie (another intern in the group), and myself (all pictured below except for me). 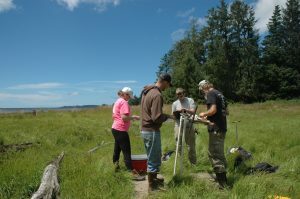 We are looking primarily at characterizing how water moves through various salt marshes around Tillamook Bay, OR and seeing if we can use various models (that were created for other outside sites) at these sites to predict changes in the environment due to different factors. To eventually accomplish that goal, Katie and I will be analyzing soil cores to look at the hydrology, soil chemistry, and soil physics of these salt marshes. I originally found out about the Summer Scholars program when I was looking at OSU for graduate school. I’m really passionate about studying water quality and one of my long term goals is to be able to participate in creating a management plan for a certain area to improve coastal water quality while appeasing local business owners and nearby residents. This is why I am so excited to be a part of this research. Even though I won’t be here to see the project all the way through, I am very confident that the work we are doing will lead to more knowledge about Tillamook Bay and management plans will have a greater chance of being established in this area. The picture above was taken this past Thursday in Tillamook Bay when we were installing wells in the salt marshes to track the water pressure in different areas of the marsh. It was a surprisingly beautiful day considering the weather was predicted to consist of severe rain and possible thunderstorms. It was the one day so far in Oregon where we completely missed any sort of rainfall. This was my first experience conducting field work in salt marshes and it was a lot of fun. We used a corer to take out soil cores in the marsh which were then sectioned off and soil characteristics were identified while we were still in the field. Wells made out of PVC piping were then installed and HOBO (yeah I know it’s a weird name but that’s just what they’re called) sensors were put into the wells to measure the water pressure over time. We should be going back to this particular site in about a month to remove the sensors and analyze the water pressure data. We now have eight cores to analyze from Thursday, plus the four cores taken from site 7 before we arrived in Newport, AND now we have water pressure data to work with…so I am currently preparing for a very busy week ahead of me. Knowing that my contribution to this project will hopefully improve the health of the environment and possibly even the standard of living in the Tillamook area makes me really excited to analyze the data. Other aspects of living in Newport and being a Summer Scholar are getting to explore the area and getting to meet other like-minded individuals from across the country. 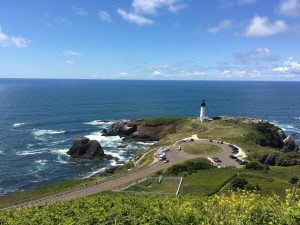 My roommates and I went to the Yaquina Head lighthouse on Saturday and I highly recommend going! It was beautiful and the area has great intertidal zone access. I definitely suggest looking at a tide chart before going and planning your trip around low tide so you can go out further and see more. We went to a nearby beach today which was also beautiful but windy. Very windy. Hopefully the next time we try to go the conditions will be a little better. I’m still having trouble getting all of the sand out of my clothes. Hopefully I’ll have some really interesting data and some beautiful pictures to share next week!